Not only did bringing dinosaurs back to life seem plausible in the film, it also seemed realistic, which took its cues from Michael Crichton’s book of the same name. There is still something so special about the ‘Jurassic Park‘ movies. The sense of wonder, science, suspense, and magic are all present in these films, especially the first movie, which I think we all gravitate towards on some level. Nothing will ever replace these films, as they are still good in their own right, no matter how much they lost their way over the years. Of course the first film went on to make more money than just about anything at the time, which is when we got ‘Jurassic Park 2: The Lost World‘, which brought back Jeff Goldblum to the island, where a business was trying to capture the wild dinosaurs and bring them to the mainland in hopes of starting a giant petting zoo and attraction theme park. While the first half of the film was a lot of fun and brought out some new ideas, the 2nd half saw the dinosaurs running wild in the USA in a major city, which Spielberg brought out the silliness of it all, even having some Japanese tourists taking pictures of the dinosaurs that were chasing them, in reference to ‘Godzilla‘. I’m fine with this, but it just didn’t seem to meld right with the rest of the story, but was rather set up for laughs more than anything. ‘Jurassic Park 3‘ was a smaller story of sorts, where a guy hired Dr. Alan Grant to go back to the dinosaur island for research, but instead, it was all a lie to rescue this person’s kid, who somehow got lost on the island. What results is an escape off the island movie with a few kids, which brings it back to the first film, but in a much more over-the-top and ridiculous way. Also, this third film brought on the big bad new dinosaur that was bred through years of different dinosaurs mating. It was like a super powered dinosaur that was smart, fast, and deadly. This sounds fun on paper, but none of it translated well to the big screen. Fast forward almost 15 years later, and we got the reboot of the franchise with ‘Jurassic World‘, which was a great idea. In this film, a fully fledged ‘Jurassic Park‘ is open to the public in the same vein as a Sea World of Disneyland, where tourists can stay in hotels on the island, eat at restaurants, and see live dinosaurs in a great exhibit. It’s all interactive. However, the big business behind this theme park created a hybrid dinosaur that is smarter and deadlier than anything before it, thus breaking out and causing the other dinosaurs to attack the thousands of tourists on the island. Again, this sounds great on paper, and there is a lot of fun to be had here, however most of the film is just silly and over-the-top. Whatever nostalgic or magic feel I had or we all had with the original film is long gone with ‘Jurassic World‘, but there is still some fun to be had here on a different level. Still, after all these years – all 65 million of them – dinosaurs are fun to watch on screen, thanks to ‘Jurassic Park‘. The Video: All four films now have a 2160p UHD transfer in 4K with HDR10 that looks impressive. Surprisingly, the old films from 1993 still hold up with all of the CGI effects that would normally not look that good with this new 4K transfer, meaning the visual effects would look a bit fake. That’s not the case here though. These old school CGI effects still hold up nicely under 4K environments and never go soft. The defining lines and wrinkles, and even scars on the dinosaurs look impressive at all times, just like they looked back on the big screen all of those years ago. I was impressed for sure. The practical effects look upgraded in 4K as well with every single detail coming across on screen easily. You’ll be able to see the excellent work on the dinosaur’s skin and even their details in their eyeballs. Human facial features and wardrobe textures look equally great too. In darker lit scenes, the detail is never hindered either. There are some darker sequences in Part II and III that can go a bit soft in the darkness of the trees and woods, but it’s nothing really to write home about or complain. Individual hairs can be seen easily and other wide shot sets and on location shots look impressive. The HDR10 colors are fantastic in each film that bring to life the earth tones of the forests, islands, and dinosaur colors. They are enhanced to bring out the secondary tones even more to distinguish them from their background and other skin colors. I was hugely satisfied with this. Greens, browns, and blues really pop throughout, along with that famous bright green and red color scheme in the first film. 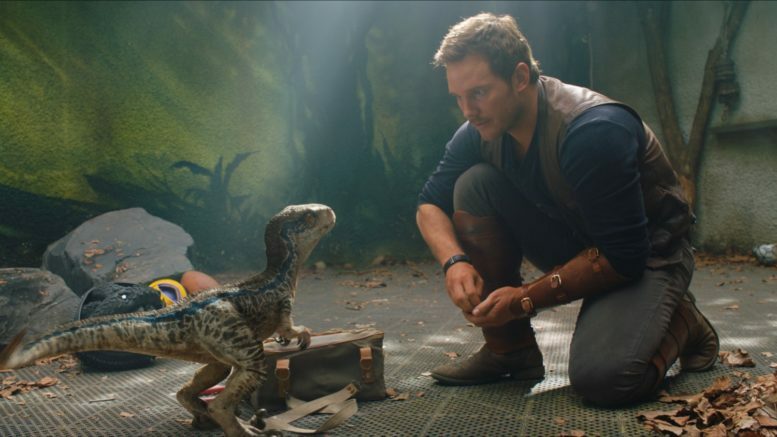 In ‘Jurassic World‘, the color scheme has a bigger blue impact, so there are many different shades of blue, which the HDR10 brings out. The black levels are all deep and inky with no wash out or bleeding, and the skin tones are all natural too. There are some natural layers of grain throughout that never really fluctuates either. Lastly, there are no major issues with any banding, aliasing, or video noise, leaving this video presentation with great marks. The Audio: All four films have been given the DTS:X audio treatment, which is their version of Dolby Atmos, and it all sounds amazing. The sounds effects for these films were quite feat as filmmakers and sound engineers had to draw from scratch on what dinosaurs might have sounded like. Mixing a ton of different noises to make one roar or screech all worked perfectly in these films. Sound effects of dinosaurs noises and nature sounds, such as small insects buzzing around and tree leaves blowing in the wind all are robust and full at all times. The T-rex noises pack a big hefty low end with each roar, as do the lighter sounds of the velociraptors. Vehicles and gunshots all pack big punches too with some great directionality to them as well. The DTS:X provides a height element, especially with rain and other flying dinosaurs on the island and theme parks that sounds great. Other ambient noises all sound loud with wide dynamics too. There is no shortage of great sounds here. John Williams‘ score is iconic and always enhances the mood and suspense in each film. The dialogue is crystal clear and easy to follow along with, and free of pops, cracks, hiss, and shrills. Each film has a great audio presentation that provides ample bass and high ends that perfects every aspect of video. Return to Jurassic Park: Dawn of a New Era (HD, 25 Mins.) – A cool look at some of the visual effects of the film with cast and crew interviews talking about working with practical effects, CGI effects, Stan Winston, and Steven Spielberg. Making Prehistory (HD, 20 Mins.) – This also takes a more in depth look at the animatronics and practical dinosaur effects, particularly with the actors working with them. Along with that, we get to see some of the sounds that were made that resulted in the dinosaur’s sounds. The Next Step in Evolution (HD, 15 Mins.) – This bonus feature focuses on the CGI effects mainly, where Spielberg talks about his input on how the visual effects should look. The soundtrack is also talked about here too. Archival Featurettes (HD, 66 Mins.) – There are a few vintage EPK fluff pieces here that focus on the visual effects, on-set footage, Spielberg, and the hurricane that hit while filming the movie. Behind the Scenes (HD, 27 Mins.) – There are a few segments that include storyboards, galleries of photos and promo materials, along with scout location videos, sound engineers working on the noises for the film, and some of the early visual effects tests. Jurassic Park: Making the Game (HD, 5 Mins.) – The old school video game is shown here with some interviews with the creators talking about making it. Return to Jurassic Park: Finding the Lost World (HD, 28 Mins.) – Here is an in depth look at the making of the 2nd film with cast and crew interviews, including Spielberg coming back for the sequel, the filmmakers going in a darker direction than originally planned, visual effects, and on set footage. Something Survived (HD, 17 Mins.) – More CGI effects and practical effects are discussed here and looked at here, along with some fun interviews with the cast and crew who all had a great time on the film. Also, the film’s final act is talked about in how it was written last minute. Archival Featurettes (HD, 84 Mins.) – There is quite a bit of different segments here from vintage interviews and on set footage that discuss making the film and a conversation with author Michael Crichton. Behind the Scenes (HD, 21 Mins.) – More vintage extras are included here with storyboards, still galleries, and some footage with pre and post visual effects are included. Deleted Scenes (HD, 2 Mins.) – A couple of short scenes are included here that don’t add anything to the final product. Trailer (HD, 2 Mins.) – The trailer for the film. Return to Jurassic Park: The Third Adventure (HD, 25 Mins.) – Cast and crew interviews, along with some on-set footage make this extra worthwhile, as people talk about working with director Joe Johnston, the new hybrid dinosaur, and the visual and practical effects. 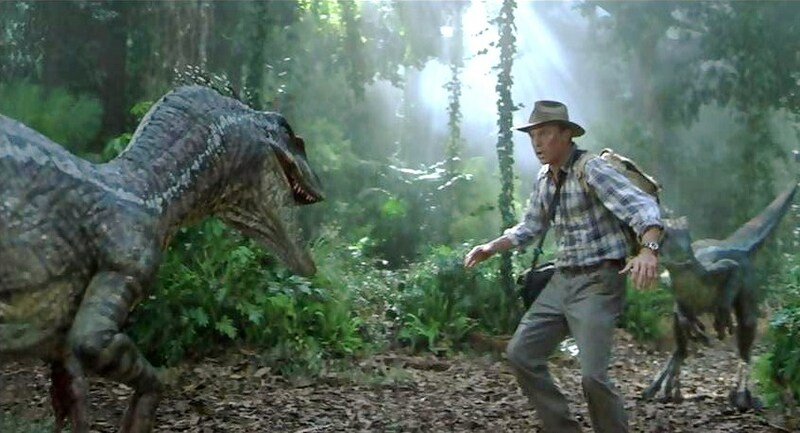 Audio Commentary – A few visual effects wizards, including Stan Winston talk about the film from a technical standpoint and how they made the dinosaurs. Its quite a lot fun, but has some big gaps in between discussions. Archival Featurettes (HD, 78 Mins.) – Once again, we have more vintage interviews from the film, with behind the scenes, cast and crew interviews, the visual effects, storyboards, and even some time with a real life paleontologist. Behind the Scenes (HD, 29 Mins.) – Much more cool visual effects talk and behind the scenes work with practical effects on the dinosaurs, along with some CGI work. Welcome to Jurassic World (HD, 30 Mins.) – Cast and crew talk about coming back to the franchise, shooting the film, working with each other, and some of the cool dinosaurs. Dinosaurs Roam Once Again (HD, 16 Mins.) 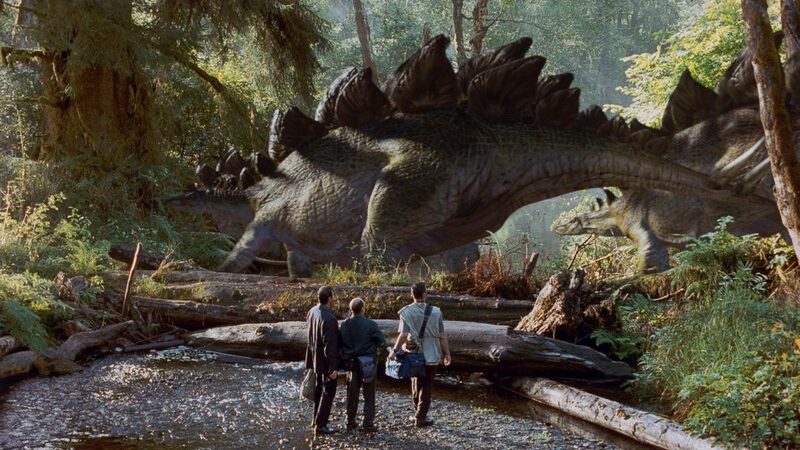 – A closer glimpse at the visual effects that went into making the dinosaurs for this new film. Chris and Colin Take on the World (HD, 9 Mins.) – Chris Pratt and Colin Trevorrow talk about making the film, fun stories from the set, and their fondness for the original films. Deletes Scenes (HD, 6 Mins.) – A collection of deleted scenes that don’t add too much to the story or characters. All-Access Pass (HD, 10 Mins.) – Chris Pratt and Colin Trevorrow talk about some of the big visual effects with some on set footage and how they made these big scenes. Innovation Center Tour (HD, 2 Mins.) – Chris Pratt gives a very short tour of the new Visitor Center at Jurassic Park. 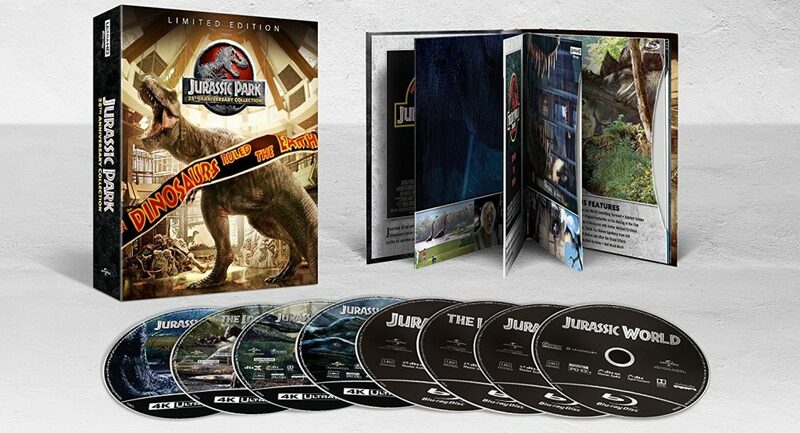 This Jurassic Park 4 Movie Collection on 4K UHD is quite fantastic. You get all four films with all of the respective and previous bonus content, along with new, amazing video transfers and audio tracks that only enhance the viewing experience. The 4K UHD video with HDR10 is fantastic and never really hinders the video, while the added height speakers are glorious with every horrific and amazing sound. All of the extras are entertaining and informative as well. This packaging is easy to use and sleek, which is a MUST-OWN for any fan of the films. 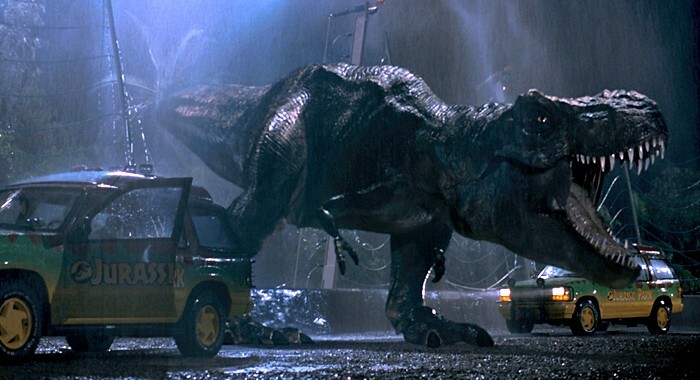 The Original ‘Jurassic Park’ Will be Re-Released in 3D!!! This entry was posted on Friday, June 1st, 2018 at 5:45 pm	and is filed under Film, News. You can follow any responses to this entry through the RSS 2.0 feed. You can skip to the end and leave a response. Pinging is currently not allowed. « Blu-ray Review: ‘A Wrinkle In Time’!